She Kills Monsters, a dramatic comedy produced by the UW-Eau Claire Music and Theatre Arts Department, will debut at the Pablo Center at the Confluence on Dec. 11 and run through Dec. 16. The production tells the story of Agnes Evans, a high school teacher who has tragically lost her mother, father, and sister in a car accident. While cleaning out the family home, she discovers a Dungeons and Dragons notebook that belonged to her sister. Through the notebook and the game she gets to know her sister again. The show incorporates fantasy and comedic elements, and features a cast of 16. The arena-style set allows the audience to fill in on all sides of the action. 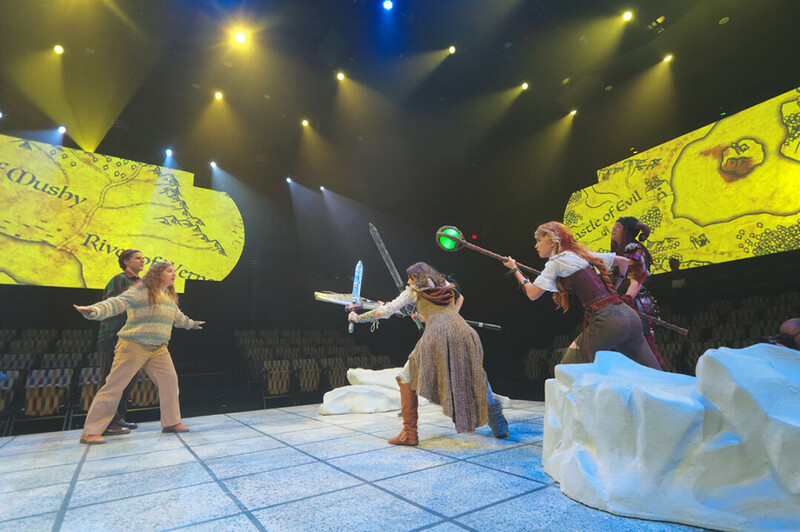 Arthur Grothe, artistic director of theater, says the show has a little something for everyone, and adds that knowledge of Dungeons and Dragons is not necessary to enjoy it. “The show combines meaningful realistic scenes with fight choreography and comic scenes that utilize pop culture references,” he said. “There’s a wide array of elements in the show including a dance battle, a demonic Jell-O mold, a five-headed dragon, and vampiric cheerleaders. So, audience should expect a comic, poignant, at times realistic, and at times fantastical story of grief, connection, acceptance, and reconciliation.” Grothe also said the show is unique in that the playwright, Qui Nguygen, combined elements normally found in film and television for this stage production, resulting in larger-than-life characters in a whimsical world. Tickets, which are $16 for students and $22 for adults, are available at pablocenter.org.